April 8, 2019 (Guthrie Center, Iowa) For more than 10 years, AJ’s Concrete Pumping, a division of Sutherland Concrete, Vancouver, B.C., has been using SafetyTech® Outrigger Pads and, more recently, FiberMax® Outrigger Pads, to solve setup challenges presented when working in poor ground conditions. However, Sutherland was also looking for an engineered cribbing solution to add height when operating in unlevel conditions, and one that would stand up to the company’s stringent safety standards. 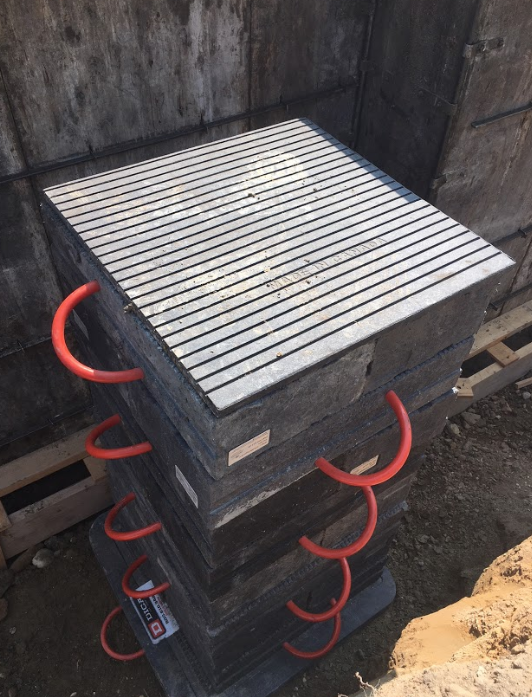 They found the answer in DICA’s interlocking ProStack® plastic cribbing blocks, which provide 6 inches of height per stacked level, and were the perfect solution for adding the height AJ’s Concrete Pumping needed. 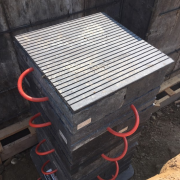 By interlocking together, ProStack cribbing can be stacked to provide a safe setup in situations where the ground is not level and additional height is needed. With ProStack Cribbing Blocks providing the height and support needed, AJ’s operators can set up directly in an excavated area. Before purchasing ProStack Cribbing, operators grabbed timbers from the yard to use for cribbing. “We had to trust the crews to use good stuff, not timbers that were rotten. With ProStack we have zero fail rate, zero wear and tear, and we take the liability off the shoulders of the operator,” said Sutherland. “Concrete pumping is very competitive in our market. Products like ProStack help us stay ahead of the curve, and it gives us a professional appearance,” said Sutherland. Not only does ProStack deliver productivity and efficiency for AJ’s crews, they have peace of mind in a fully engineered solution. “DICA’s published load ratings and usage guidelines give us the confidence we need and the documentation the authorities and customers are looking for. Having engineering documents to show local safety regulatory inspectors is important. Documentation is key,” said Sutherland. “We invest in the best tools and training to ensure not only an efficient concrete pour every time, but also a safe concrete pour. DICA’s engineered products help to ensure safe, and consistent setups of our equipment wherever we are working,” said Sutherland. 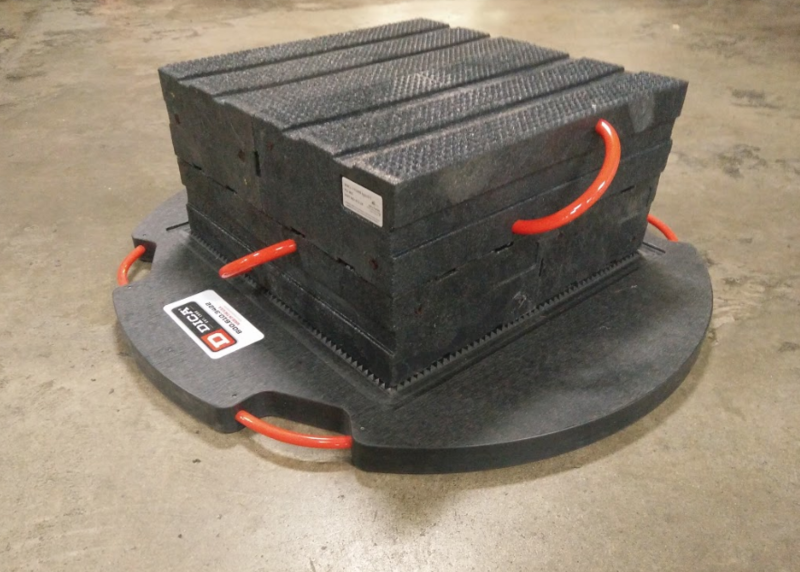 DICA is a family-owned and operated company that specializes in building high performance engineered outrigger pads, crane pads, and cribbing blocks that are lightweight, easy to use, and long-lasting. DICA products are proudly Made in the USA, ASME B30.5 compliant and used by operators in 40+ countries around the world. AJ’s Concrete Pumping, a division of Sutherland Concrete, operates a fleet of Putzmeister truck-mounted Z-boom pumps ranging from 58- to 24-meter, as well as High-Pressure Line Pumps. Since the mid-1970s, the company has provided placing and finishing services for high-end residential homes, mill installations, commercial high rises, and warehouse/tilt up slabs measuring up to 35,000 sq. ft in a single pour. With two locations, the company serves the Lower Mainland of British Columbia, and downtown Vancouver.